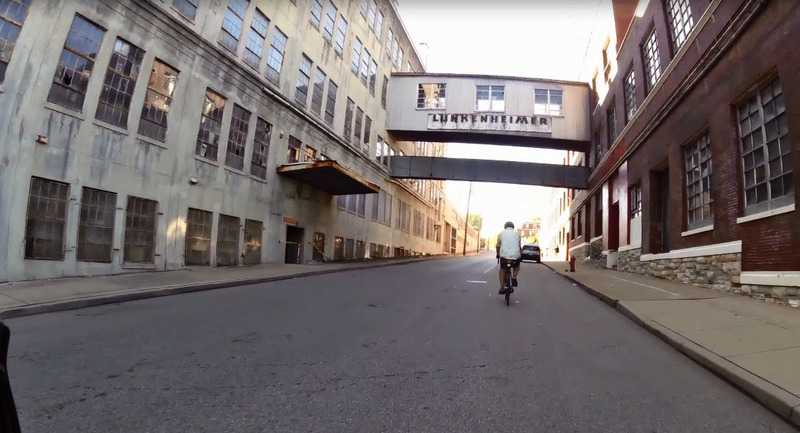 Rollin’ on the river – that was our goal for a beautiful weekend ride in and around Cincinnati. For anyone who is unfamiliar with the area, the Ohio River is a major thoroughfare for waterborne commerce and it flows right past Cincinnati. Winding through six states, barges carrying coal and other energy products make up the majority of traffic. 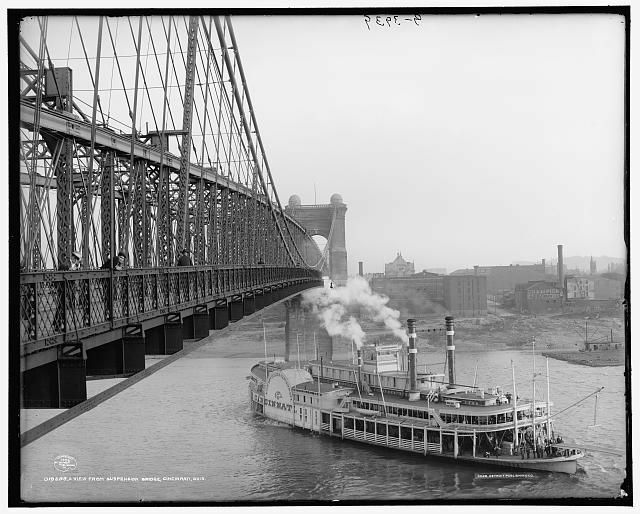 The docks at the banks of Cincinnati were once bustling ports for trade and travel. 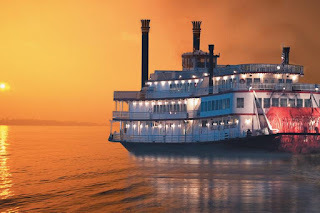 Although several riverboats designed for dining and entertainment still call her home, most of the majestic vessels of a bygone era remain only in photographs. 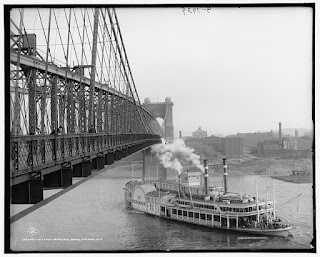 Below are several of many links to visit Cincinnati’s riverboat heritage. Recently major investments in the banks on both sides of the river have revived the River City in a major way. 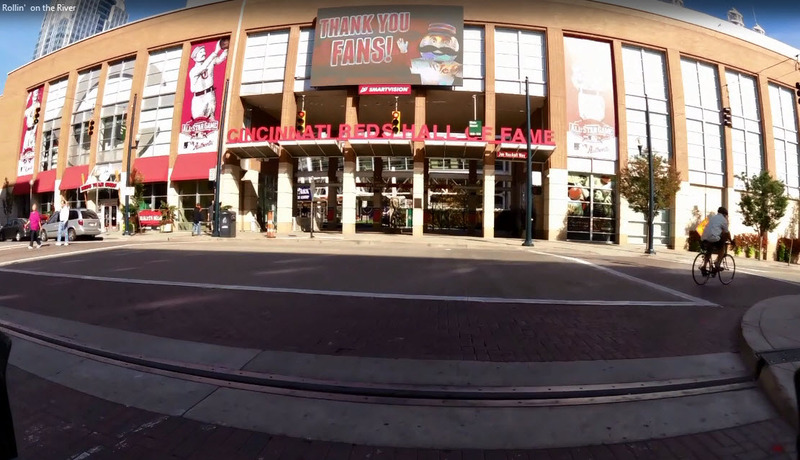 Two new stadiums, a slew of eateries, a magnificent park, and, what else, but a bike center for commuters. You can see a lot of these attributes in this six minute video. 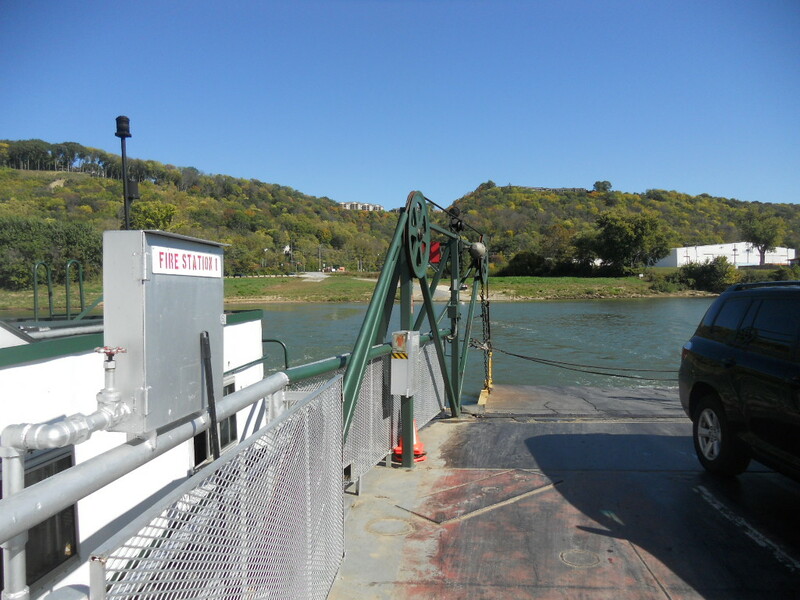 About ten miles west of the busy downtown area one can ride through the sleepy community of Sayler Park and board the historical Anderson Ferry. 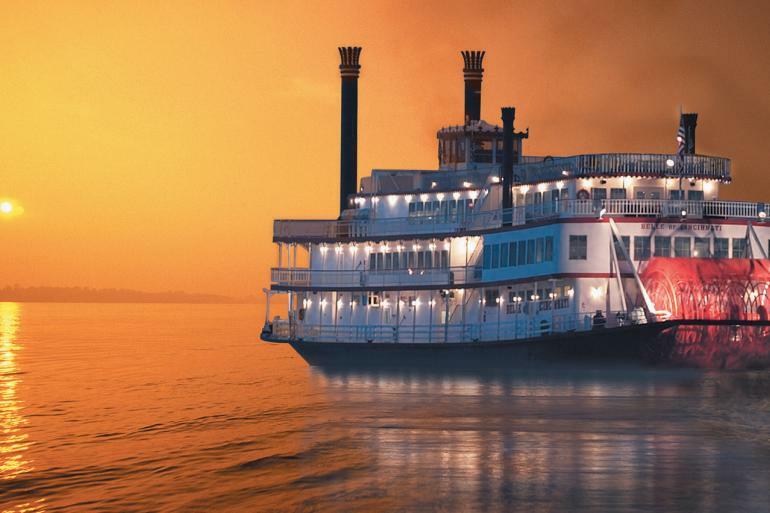 Founded in 1817, the ferry has remained in continuous operation. For a mere $1.00 you can roll your bike onto the ferry and cross the river to the banks of Kentucky. This was where Velo Junkie and I were headed on this October afternoon. We left home about noon and headed straight into a chilly wind coming from the east. I treasured it for the short time before we turned south to head to the river. In about five miles we reached the river and another five brought us right to the Anderson Ferry loading dock. 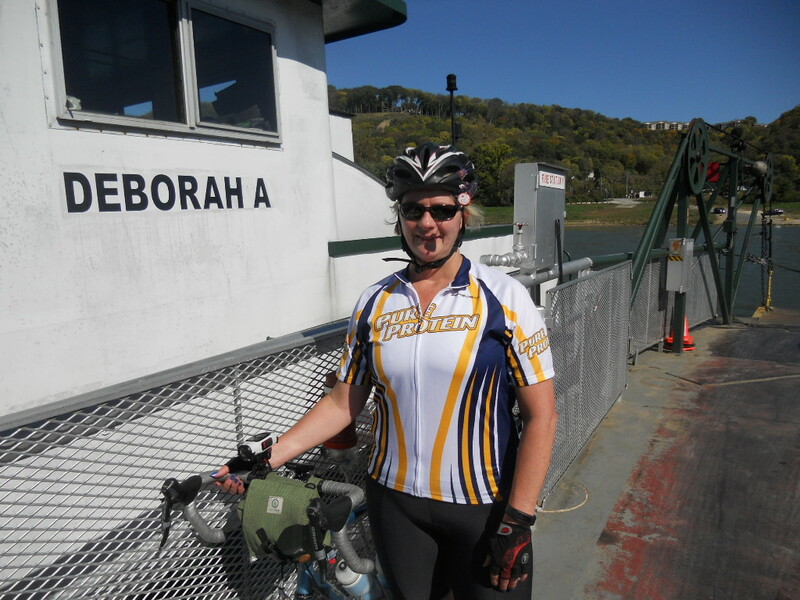 There is a very steep grade going down to the bank to board the ferry. Reluctant to roll down between cars I dismounted and walked the Gunnar aboard. Not Velo. It would take a major event to make him walk his bike anywhere, and even then he would do it while kicking and screaming. 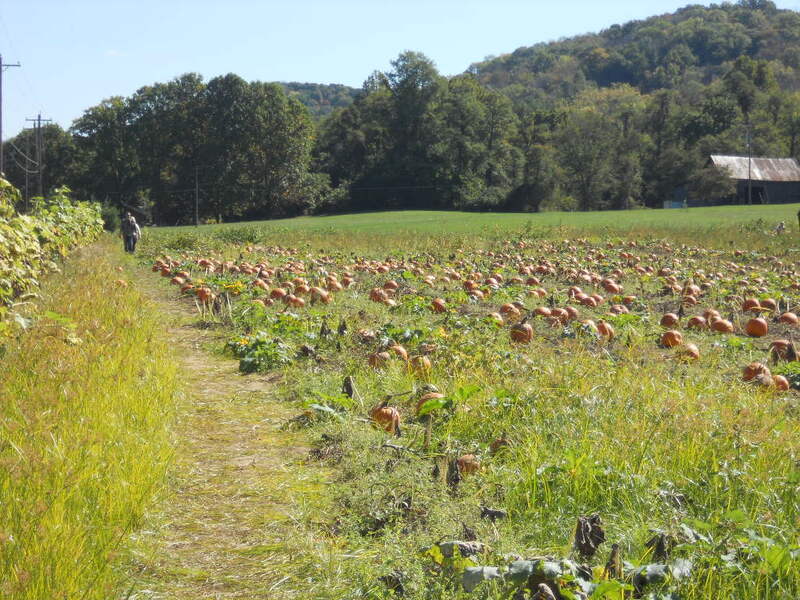 The day was gorgeous and the Kentucky side held a trove of treasures for the senses. 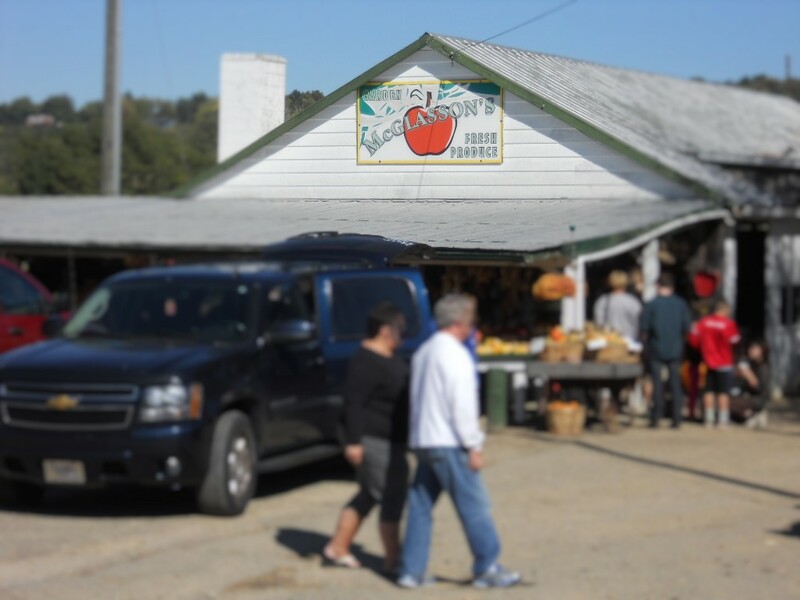 The palette of orange, green, and gold trees dotted with the occasional red barn gave way to marinas, a horse farm, a pumpkin patch, and a country farm store. We made it a point to stop at McGlassen’s Produce for some fresh-pressed apple cider. Had I remembered how rolling the terrain on KY 8 was I may have been a little more hesitant to embark. With grades upwards of 9% the Reluctant Cyclist in me grumbled but forged on, lost in the autumn folly. Velo decided to give me a new nickname – the Reluctant Shifter. I admit I hesitate to shift to my small ring. I have been riding with an old SRAM shifter that has always had a problem moving back to the big ring, hence the reason I developed the bad habit of mashing it out to the top in the big ring. That is about to change. Immediately following our ride I ordered new Shimano shifters and Velo took the old components off of the Gunnar. I think it was really because he was tired of hearing me curse on hills. We reached the end of the rural route and stopped for a quick snack and to rehydrate before heading back towards downtown Cincinnati. The long downhill coast into Covington was a sweet reward for the long uphill climb through Ludlow. The increase in traffic was inevitable the closer we got to the metro areas of northern Kentucky. 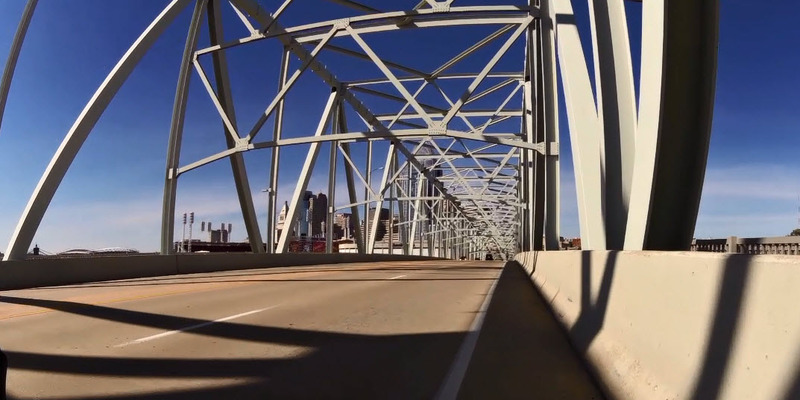 There is something exhilarating about riding your bike across a bridge and Greater Cincinnati offers many opportunities. 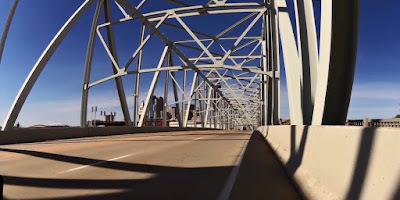 We crossed the Licking River into Newport via the 4th St. Bridge, then the Taylor-Southgate Bridge carried us across the mighty Ohio. OMG. 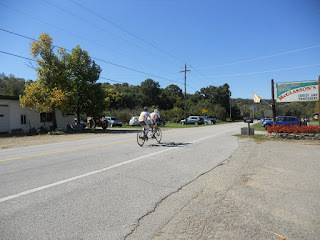 We had scheduled our ride to avoid the race that was taking place in the morning, and we did miss the race crowd. But we were not prepared for what ensued at the end of the bridge. There were hordes of people trying to locate their groups, roughly 25 tour buses, and lane closures for said buses. Every restaurant in the vicinity had a forty minute wait for food because all of these people converged on them at once. We were hungry so decided to wait it out at Jefferson Hall. Bless our server, he slid our order for nachos to the kitchen in front of a table of 24 so that we could get our food in about 20 minutes. The nachos and a Rivertown Pumpkin Ale were enough fuel to get us home. By the time we finished eating a lot of the foot traffic had dispersed so exiting the city was less stressful than entering. 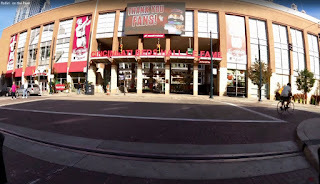 “Over the river and through the woods…” We climbed back out of the river valley passing Great American Ballpark, Paul Brown Stadium, the Kroger manufacturing plant, and the defunct Lunkenheimer factory. And to think, all of this adventure in 42 miles. He said an honest man's pillow is his peace of mind"